Although this recipe takes a little extra work because the potatoes, eggplant and tomato are pre-baked, the effort is well worth it! This recipe is an adaptation of a family tradition of a potatoes and egg dish that our mom used to make. We hope you enjoy it. Slice eggplants either lengthwise or as large circles (depending on the type you use). Place in bowl with water and add a sprinkle of salt. Let stand for about 15-30 minutes. Slice potatoes in 1/8 inch circles, and place on cookie sheet. 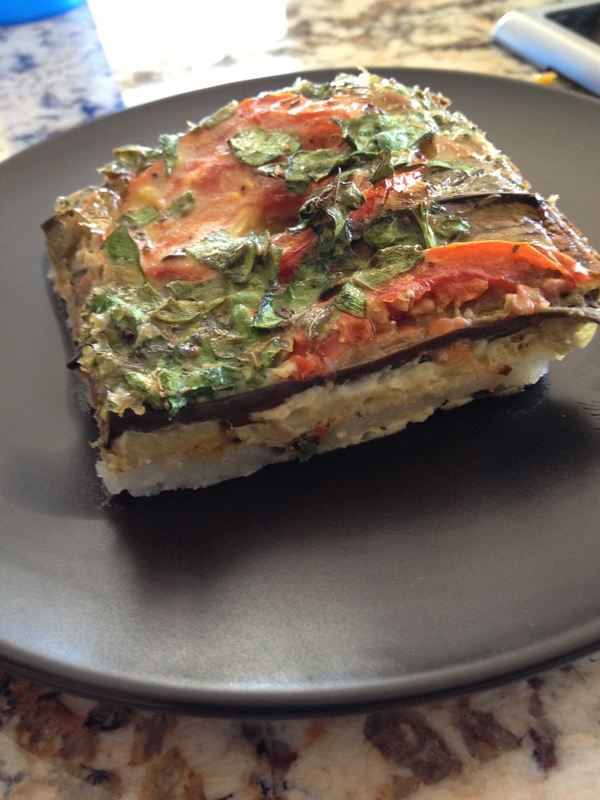 Drain water from eggplant slices and add to cookie sheet. Brush eggplant and potatoes with 1/2 tablespoon of olive oil. Sprinkle with salt and pepper. Bake potatoes and eggplant in preheated oven at 400° F for 20 minutes. Turn once halfway and brush with remaining ½ tablespoon oil. Slice tomato and add to cookie sheet with potato slices. Brush tomato with 1/2 tablespoon olive oil. Bake tomato and potatoes for another 10 minutes at 400° F.
In meantime, whisk eggs with thyme, basil, milk, flour, salt & pepper, and chopped spinach. To assemble pie, in a 7 x 11 inch baking dish, layer potatoes at bottom, eggplant slices on top of potatoes, and tomatoes on top of eggplant. Pour egg mixture on top of layers. Bake pie in oven for 20-30 minutes at 400° F. Watch the pie to avoid burning. Note: If you’d like more than 1 layer to this pie, double up the potatoes, eggplant and potatoes and add 1 egg to the egg mixture.